Who doesn't love a good before and after pic? I spent last weekend curating a lifetime of memories...only this time, it was my own. 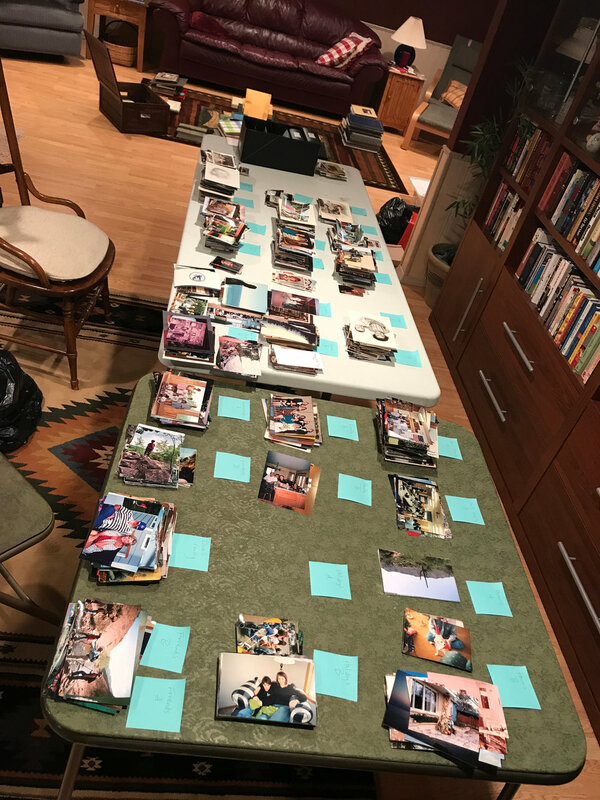 Over 2.5 days, my mom, my sister, my daughter and I organized, rescued and sorted over 40 albums and several boxes of loose photos and memorabilia from my childhood home. I'm not gonna lie, it was hard work and while I love my family, they were way harder to keep focused than my clients. The memories and the stories kept tumbling out...which was truly awesome...but not always conducive to getting the job done. But we did get the job done...and done well. My mom did a great job printing pics and putting them in albums throughout the years, so our first task was to categorize the albums. For example, we had a pile of vacation albums, heritage albums for each parent, wedding albums for each kid and lots of family albums. Decisions needed to be made on which of these albums would get disassembled for various reasons (e.g. album falling apart, discolored photos because of sticky albums, half full albums, etc.). Once those decisions were made, we began to pull apart albums. While my mom and sister were working on that, I tackled the miscellaneous boxes of loose photos and memorabilia. By the end of the day, we had pulled apart about 25 albums and placed the pictures in photo boxes by album. We were careful to write on the backs of the pics (with a photo safe pencil) if there was information to capture from the album (e.g. my mom sometimes journaled dates, places, events and names in the album). At the end of the day we had 5 boxes of pics ready for sorting. Day 2 was all about sorting. We used a long table plus a card table, and with sticky notes, created categories including one for each immediate family member, my mom's family, my step dad's family, vacations, homes, friends, holidays and some others. We used the ABCs method of sorting (see previous blogs for details), so we also had a huge garbage bag handy to throw away those photos that just weren't that meaningful or were doubles. We got through 3 of the 5 boxes on Day 2. On Day 3, we finished sorting the final 2 boxes. When we were done, we were down to 3 boxes, which was amazing. I was able to easily pack up those 3 sorted boxes and bring them back to my office for scanning. Scanning will also include dating and keywording the pictures so we can ultimately sort them. Our goal will be to share the digital images with my siblings, as well as look for some creative solutions to bringing the favorites back into my parent's lives. Many of these albums have been in storage for years and it was so fun seeing my mom's eyes light up when all of these memories came flooding back. I haven't decided yet how I will share the digital images with my sisters and brother. Our options include creating a flashdrive for each person or using a secure Cloud service. Right now, I'm leaning toward a Cloud service because if I choose the right one, they can help me do some of the work on the dating and keywording. We will need a phase 2 of the project. Even after we get this scanning done, we still have albums that we didn't want to take apart that we need to deal with. Some, we only need to preserve a few photos in each album, while others are super cool old scrapbooks where we will want to scan the whole album. We'll get there! Honestly, I can't believe we accomplished what we did in only 2.5 days. We worked a total of about 40 hours between all 4 of us and sorted through about 80 years of memories. I would say that we likely saved about 4,000 photos. It was exhausting, but very cool to relive so many memories and hear so many stories. I think the thing that contributed most to our success was having a process and sticking to it. This project wasn't just about getting things organized (although my parents were very happy about that), it was also about peace of mind knowing that these memories will be preserved for generations. Do projects like this take a lot of time? Yes, they sometimes do. Think about how long it took you to create the memories (and the mess). Is it going to be hard work? It might be, but it's easier if you get in the right mindset and HAVE A PROCESS, which will make it go significantly faster. preserves your family's history for generations to come.